Blue food is supposedly revolting. I remember hearing of an experiment where chicken was painted with blue food colouring. People who tried them found their taste off-putting and nothing like chicken at all. I am a curious sort of person and, although I have never been good in science, I like doing experiments in my kitchen. 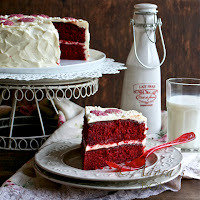 The most popular post on this blog is the red velvet cake. I like it so much and I believe that a good thing is worth repeating. Following the process of the red velvet cake recipe, I experimented on making a blue velvet cake: a velvet cake that's blue in both colour and flavour. 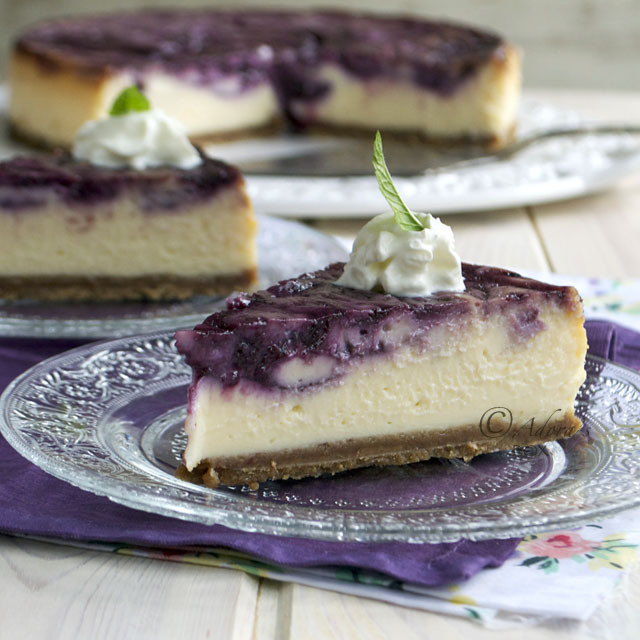 The most logical ingredient to use is blueberries. I changed the liquid I used in the red velvet cake recipe (coffee) to blueberry puree; lemon juice and zest added a citrusy tang. I used thicker Greek yoghurt instead of buttermilk to compensate for the bigger amount of liquid. I decided to make three cake layers; more layers means more space for the frosting, my favourite part. The experiment was a success. The blue coloured cake was delicious! The cake tasted of blueberries with a background citrus flavour. The texture is exactly like the red velvet cake. The crumb was moist and tender, as it should. 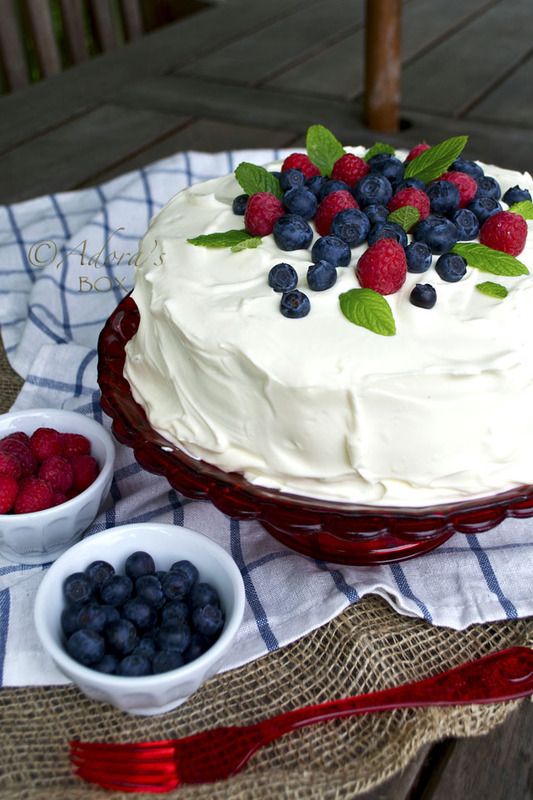 I used the same cream cheese frosting, simply swept into soft swirls and topped with fresh blueberries, raspberries and mint leaves. 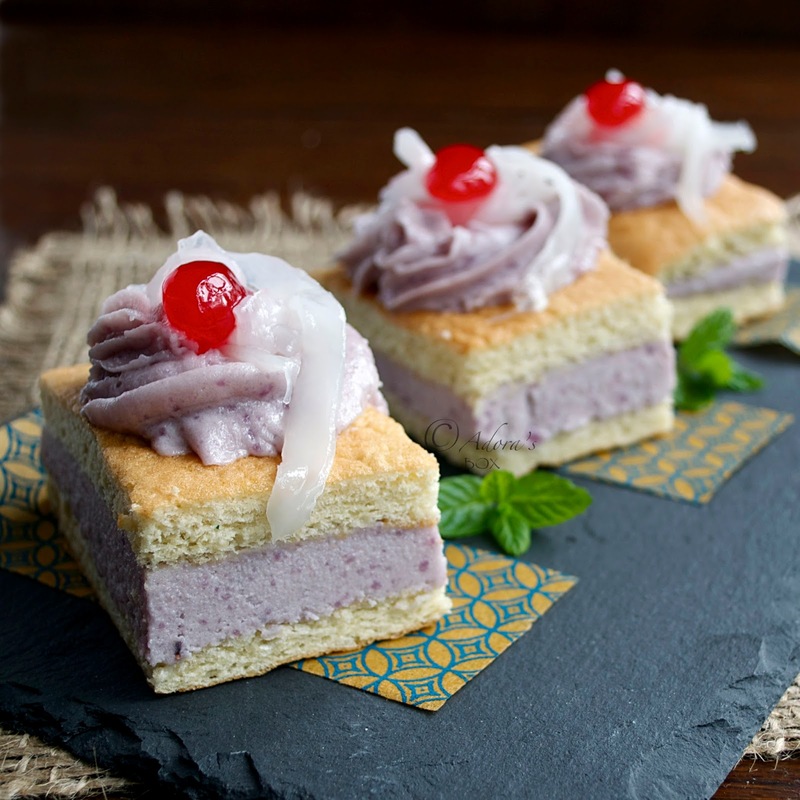 On the whole, it is unmistakably a velvet cake with a subtle fruity twist. Although called a velvet cake, it had more of a chenille look to it. I think I prefer this one better. Sorry red velvet fans, I'm switching to blue. Line the bottoms of three 9" diameter cake pans. Grease the sides. Put the blueberries in a pan and add a tablespoon of water. Bring to a boil and stir. The skin of the berries will soften very soon after. Press with a spoon and if they can easily be popped, they are ready. Transfer to a blender (or use a hand blender) and pulse briefly. No need to make it smooth. It is nice to have bits of the dark skin on the batter. In a mixing bowl, whisk the flour, baking powder, baking soda and salt together. Mix the sugar and vegetable oil in another bowl. If using gel food colouring, add it in at this stage. Add in the eggs, yoghurt, vanilla, lemon rind and juice. Blend everything together. Add 1 cup of the blueberry puree (no need to cool it down) and blend again. Use a large mixing bowl to combine all the ingredients together. Put about a quarter of the dry ingredients in the mixing bowl. Add the wet ingredients gradually, alternating with the dry ingredients, mixing after each addition just until combined. Divide the mixture equally between the prepared pans. Weighing the pans is the easiest way to ensure that the quantities are equal. I used whipping cream here instead of double cream because that is more available everywhere else. Although it has a lesser fat content than double cream, it worked really well. I added skimmed powder to give it more stability. If the weather is hot, chill your beaters and bowl before using. Whip the cream until thick and fluffy. Do not over beat. Add in the cream cheese, confectioners sugar and milk powder. Whisk again until all combined. 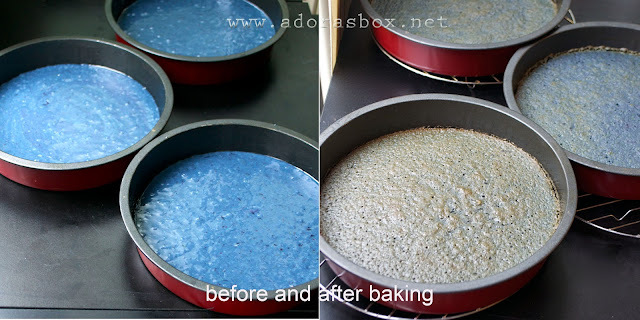 Use 1 c. of frosting to fill the bottom cake layer then top with the other cake layer. Repeat the layers. Use the rest of the frosting to ice the whole cake. 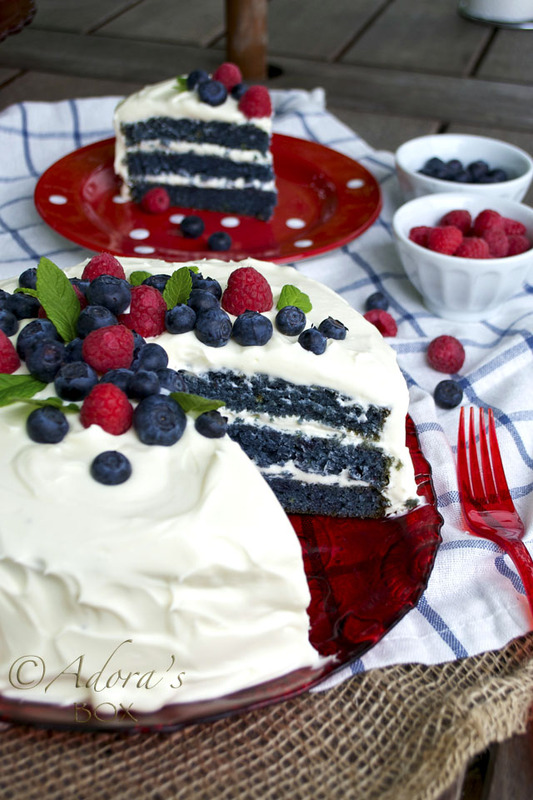 Top with blueberries, raspberries and mint leaves for decoration. 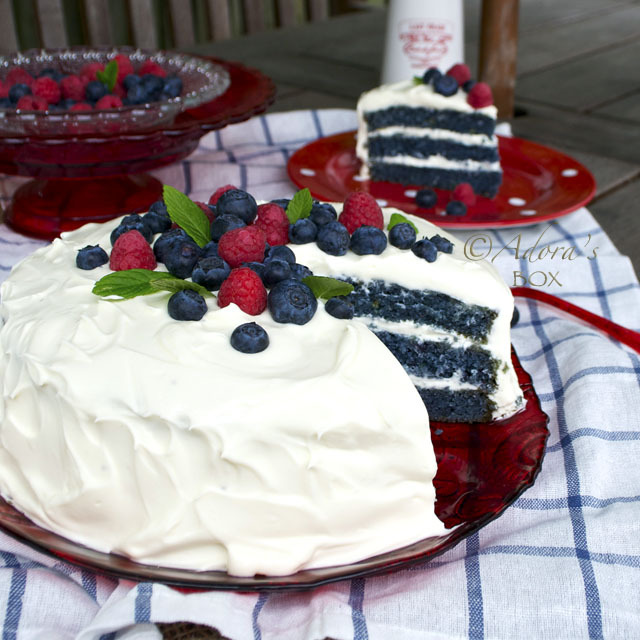 it actually looks appetizing with the blueberries, raspberries and mint leaves topping.... i would love to try this rather unusual colored desert..... would serve it to my friends! I am wondering what blue velvet taste like? Anyway I love the topping and layers of the cake, beautiful ! Oh, this is so unusual from the red velvet; and I can see that it uses yogurt instead. Would love to give this a try one day. 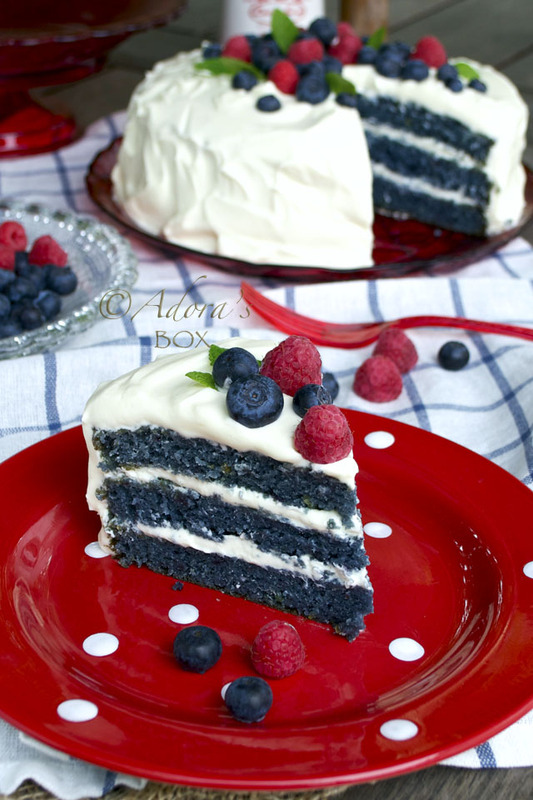 You decorated the cake looking very beautiful Adora eventhough it just some berries on top. I would love to follow your posts. But... I want to be able to print off your recipes. Is there a way to get just the recipe and not pages of pictures and narrative? I just want the recipe with one picture. Yes, you can. There's a green print button at the end of each post, just above the comments. You will have the option to delete the images and whichever portions you do not want to print. What a beautiful experiment, Adora! 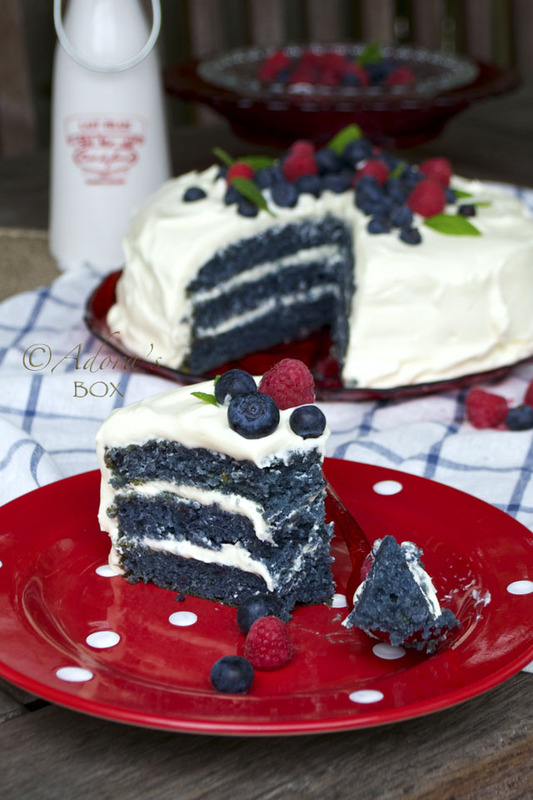 I love the unique blue color and the fact that you used a puree of blueberries. Fantastic!! There is definitely nothing revolting about this cake. Looks stunning! Maybe it's because blueberries are one of my favorite fruits that I wouldn't find other blue food revolting. Your cake is gorgeous! Thanks for sharing. Hi! Wow! What a work of art this cake is! I love it. I would love it a little better if I could have a slice. Nothing revolting here. Simply revolutionary. Hi Tamara! Plain flour is all purpose flour. Found you thru one of my cousin's posting. keep up the good work. You are a genius..love your approach. Thank you so much for the kind words, Sharon. Want to make this for my son's birthday. Just wondering, you said in the instructions 'if using gel food coloring...' Does anyone know what it would turn out like without the gel coloring? Hi Christine! The cake batter takes on the natural purplish colour of the blueberries. The food colouring could be omitted. What does this taste like with blueberries? Hi there, can the cake layers be frozen? Yes the cake layers can be frozen. The iced cake can be frozen, too. Yuuuum!! This is one of the types of cakes we had at our wedding. Definitely one of my all time favorites!! looks incredible. would love to use this recipe but would this cake be too moist and tender to carve. I'm guessing the yogurt would make it super moist. I now know what to do with my frozen blueberries that I picked.